TV Land has announced that Hot in Cleveland and The Soul Man will kick off their new seasons on Wednesday, March 26th, with a pair of “live” episodes. Series stars Betty White and Cedric “The Entertainer” will make crossovers and appear on both shows. Los Angeles, CA – TV Land announced today a LIVE television event: one hilarious hour with two LIVE back-to-back season premieres of original sitcoms – “Hot in Cleveland” and “The Soul Man.” “Hot in Cleveland” will go LIVE on Wednesday, March 26th at 10pm ET, and “The Soul Man” will follow at 10:30pm ET. “The Soul Man,” a spin-off of “Hot in Cleveland,” stars Cedric “The Entertainer” as Reverend Boyce Ballentine, a character that originated as Elka Ostrovsky’s (Betty White, “Hot in Cleveland”) pastor. Their characters will again cross over into each other’s worlds during the live shows. The West Coast will get the live-to-tape versions beginning at 10pm PT. 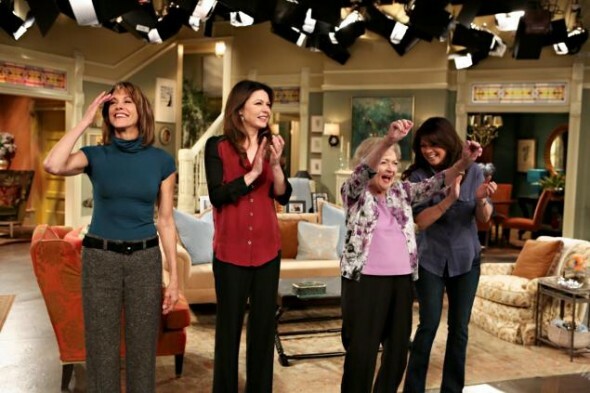 “Hot in Cleveland” premiered their last season with a live episode on June 19, 2013. Guest stars in this episode included Brian Baumgartner (“The Office”), Danny Pudi (“Community”), Shirley Jones (“The Partridge Family”) and “Star Trek” legend William Shatner, and the episode averaged 2.7 million total viewers (Source: Nielsen, L+7). “Hot in Cleveland” revolves around three fabulous best friends from LA – Melanie Moretti (Valerie Bertinelli), Joy Scroggs (Jane Leeves) and Victoria Chase (Wendie Malick) – who find their lives changed forever when their plane, headed for Paris, makes an emergency landing in Cleveland. When the friends discover that life is better in Cleveland, they decide to stay. Starting over together, they rent a house that happens to come with a very opinioned caretaker, Elka Ostrovsky (White). “The Soul Man” follows R&B superstar-turned-minister Reverend Boyce “The Voice” Ballentine (Cedric) after he relocated from Las Vegas to St. Louis with his wife Lolli (Niecy Nash). While learning to adjust to their new humble life, they have plenty of obstacles in their way. One of these is Boyce’s brother Stamps (Wesley Jonathan), who seems to have taken up permanent residence in their house – and that’s only made worse when Stamps sparks a new relationship with Lolli’s sister (Kellee Stewart). Viacom (NASDAQ: VIAB, VIA) is home to premier global media brands that create compelling television programs, motion pictures, short-form video, apps, games, consumer products, social media and other entertainment content for audiences in more than 160 countries and territories. Viacom’s media networks, including MTV, VH1, CMT, Logo, BET, CENTRIC, Nickelodeon, Nick Jr., TeenNick, Nicktoons, Nick at Nite, Comedy Central, TV Land, SPIKE, T?3s , Paramount Channel and VIVA, reach approximately 700 million television subscribers worldwide. Paramount Pictures, America’s oldest film studio, is a major global producer and distributor of filmed entertainment. What do you think? Do you plan on watching either of these live season debuts? More about: Hot in Cleveland, Hot in Cleveland: canceled or renewed?, The Soul Man, The Soul Man: canceled or renewed? I just sent in a submission regarding Hot in Cleveland; please disregard the first e-mail address and use this one instead. Thank you. I loev Hot in Cleveland and wouldn’t miss an episode. It’s hilarious!